My name is Antonia and I am doing my 12-months voluntary service in a kindergarten in Võru in South Estonia. As my initiative project I organized a postcard exchange between my kindergarten and a pre-school in England and France and a kindergarten in Germany. My aim was to involve the kids as much as possible so they would gain the most valuable experiences for them from this. We were the first ones to send a letter. I asked the children to draw pictures of what they would like to show the kids in the other countries and to let me know if they had any questions or things they would like to tell them. They came up with some funny things: Tristan: “How many toys do you have?”, Jann Jakob: “Do you eat pancakes every morning?” and Trey: “Why do you live so far away and not in Võru?”. The first kindergarten to answer was the German one, England and France followed. Kids and teachers were really impressed by all the different concepts of the kindergartens. For example children in France and England were already in school and the kindergarten in Germany even had a group which is in the forest each day. The children in the Estonian kindergarten were very intrigued by their new friends from far away. We put up a wall display including all the materials sent to us from the other countries and I often caught the kids showing their parents it and telling them about the other nurseries. It helped that all kindergartens had included many pictures because these are more accessible for the kids. The kindergarten from England for example also sent some dried flowers and other plants they could find near to their facility because Marelle had asked them: “What flowers grow where you live?”. We sent another package to each kindergarten in June. 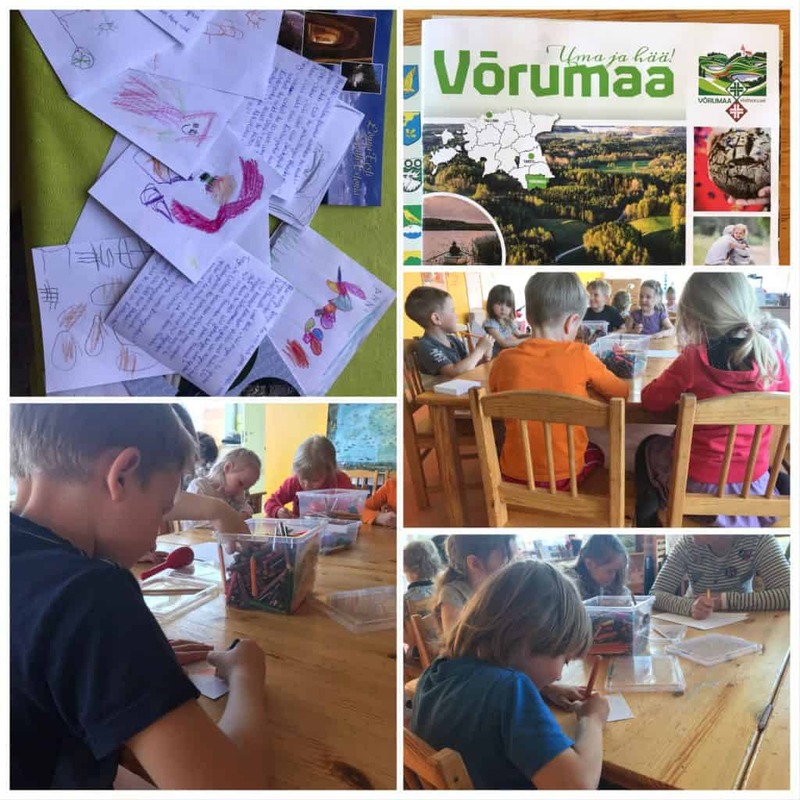 This time we did not only include pictures the kids had drawn and postcards but also some materials about Võru and surroundings with many pictures of course. We taught the children how to draw the different flags of the countries and put some tickers of the Estonian flag in the parcel too. To sum up the kids in all four countries gained a more in depth awareness of each other’s countries and had a glimpse of what the European community can bring to them. Which is freedom, no barriers, communication flow and new connections. However, there was also a second part to my initiative project. 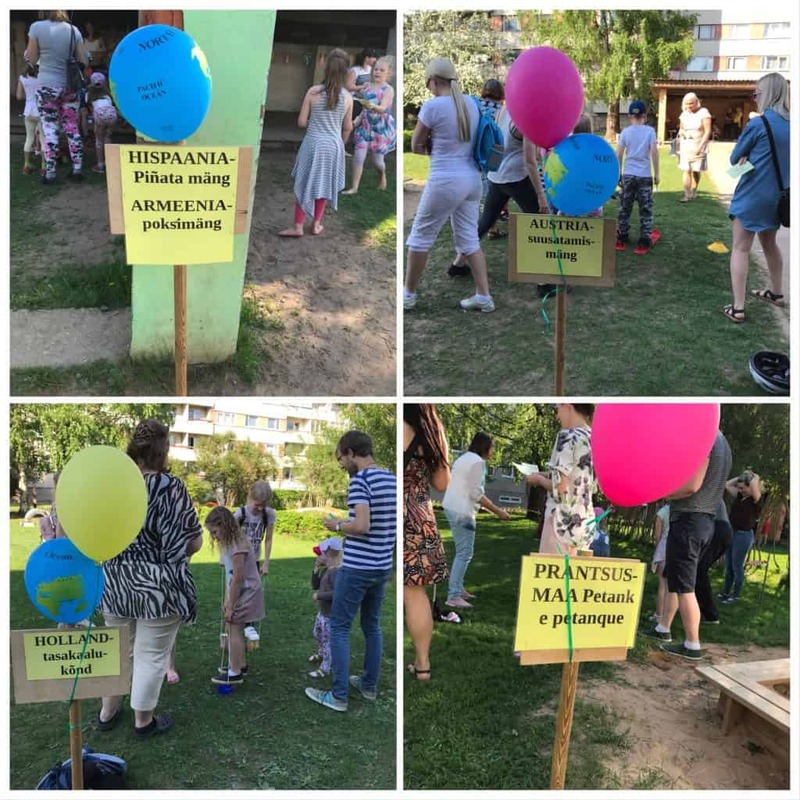 Annually my project kindergarten organizes a Family-day for the whole kindergarten including parents and siblings. This year there were ponies, the fire brigade came with one of their fire engines, there was food and drinks, a flower market and many many games and activities for the kids. 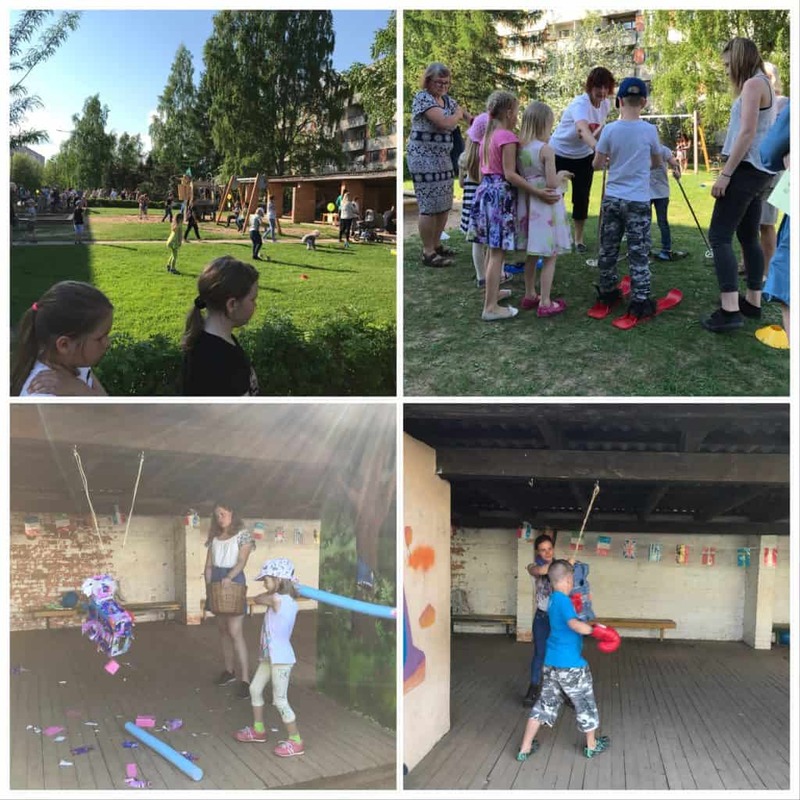 As a part of this so in cooperation with my project I asked a few volunteers to come to Võru that day and introduce the kids to some activity typical for their country. Volunteers from Austria, France, the Netherlands, Armenia, Spain and Germany came. In the mountains of Austria the kids were able to do some skiing. In France the traditional French game pétanque also now as boules was played. In the Netherlands they could race on so called “Klossen” made out of tins and having string to hold on to. Referring to a famous boxer from Armenia the kids could let out some energy and try out boxing. For the Spanish game we had built a Piñata which is a cardboard box decorated to look like e.g. a lama and is filled with candies. The children had a swimming noodle and by getting the Piñata so swing got the sweets to fall out through the holes in the cardboard. The German game was in reference to Germany being so football crazy. The children had to try and score goals with a football whilst their eyes were covered. Sometimes not only the children had a go at the games. Especially the French boules was a hit with the parents. There was even a newspaper report about this event later in the newspaper. However not only by reading this but of course attending the event and having direct contact with the volunteers I think the participants again enlarged their awareness of what being European means. I am very happy I could widen my target group so immensely through this project and provoke an extended intercultural exchange.